In front of the entire conference stood a 14-year-old boy. He’d eaten little during lunch – perhaps it was nerves – but more likely it was the lack of anything the least bit palatable or familiar to his tastes. However, he had taken multiple bags of chips from the lunch buffet, and had them placed around his spot at the table like a small crispy fortress. I considered admonishing him that this was not a healthy lunch – that he couldn’t eat all those chips. Instead I leaned in and whispered, “You are going to be fabulous!” and he favoured me with a glance and a shrug and then returned his focus to his iPad. I somehow convinced him to wipe the tiny traces of dorito-red from around his mouth without heightening his anxiety – or revealing mine; a layering-in that is never helpful. Then it was time for the keynote address. He rose… and headed to the podium where he was being introduced by his good friend, mentor, and fellow self-advocate, Laura Nagle. I wondered fleetingly if he would change his mind… but up he went. Now he stood there – tiny white remote in hand – waiting for just a moment – before he plunged right in. He caught my eyes right then – and I gave him my barely perceptible you-can-do-it smile and nod combo. In that moment… the room was silent – waiting. Then he began, with a voice a little deeper than it was 5 months ago, reminding me that adulthood is perched on the horizon. He spoke with a growing confidence as he gained momentum, and clicked his way through the slides of his presentation. – but it can be hard in a classroom. I need you to understand that this doesn’t mean I wasn’t listening… or that I was misbehaving. He explained the intensity of his emotions, and talked of anxiety, resilience, communication, friendship, special interests, and more. He talked about his experiences and perspective and expressed what it is he needs from others in terms of support. I need you to encourage me to stick with it… this gives me the message that I can do it and that you believe in me. He sat down again behind his crispy fortress – perhaps not quite understanding the full measure of his message and the almost reverent response to the enormity and power of his offering. And too… I recognized his quiet stance of pride and empowerment. The silence was expectant – and his unassuming response perhaps almost anticlimactic. Clearly people wanted more: to talk to H, and interact, and share their appreciation… but he was done. People were sensitive to this and gave him the space he needed. H seemed a little taller than he had just minutes before, as he single-nodded his head in silent agreement… and he focused once again upon the iPad. 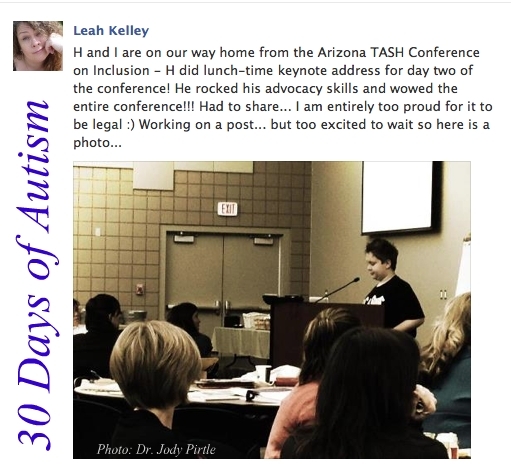 A bit of background: In mid January H and I had the honour of participating in the Arizona TASH 9th Annual Conference on Inclusive Practices (also sponsored by AzWINS). We flew from Vancouver to Phoenix and then settled in for the conference. We were met at the airport by Laura Nagle and had the lovely opportunity to hang out with her and other amazing people, including Sir Max and Susan Marks, aka @LifeAgitator on Twitter and producer of the wonderful documentary, Vectors of Autism. This AzTASH conference was H’s second. He was invited to participate as a self-advocate, much the same as last year, but this year there were a few differences. H participated in two of the I am Norm sessions facilitated by Kristen Dougherty. I wanted to be there – but the program was designed for youth and I thought H deserved to be there without his mom at his side. (Although – I must admit – it wasn’t easy for me…) Thank you to Kristen for her wonderful support and skills of inclusion! The other was that H was invited to do the lunch-time keynote address for day two of the conference. He presented Dear Teacher: A Letter from H, which he has presented to educators in a graduate program at Simon Fraser University, and also to the staff at his own school. Presenting in front of the entire conference was not easy for H, but he did it – and he did it very well. After his presentation he was pretty much out of spoons and needed time to pull back and get his footing. I am certain, however, that this positive and empowering experience will be something he carries with him and will resonate on many levels as he continues to develop his sense of self and advocacy skills. 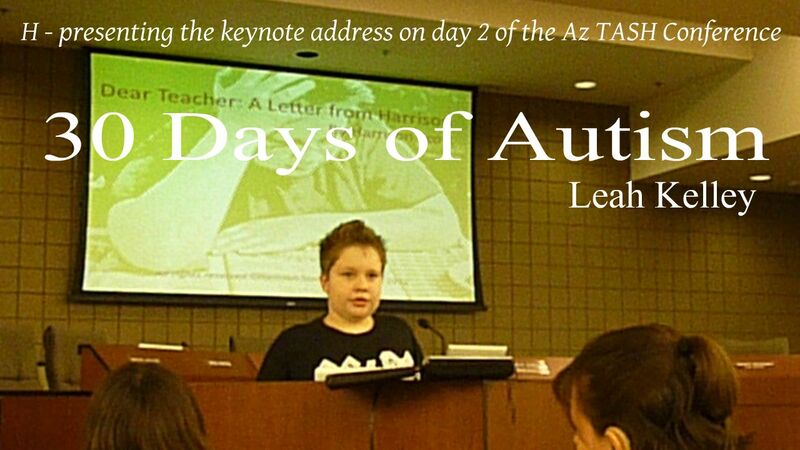 I’d like to express my appreciation to the wonderful people at Arizona TASH for inviting me to present, for including H as a self-advocate, for your gracious welcome and hospitality, and for the amazing work you are doing to change the world! 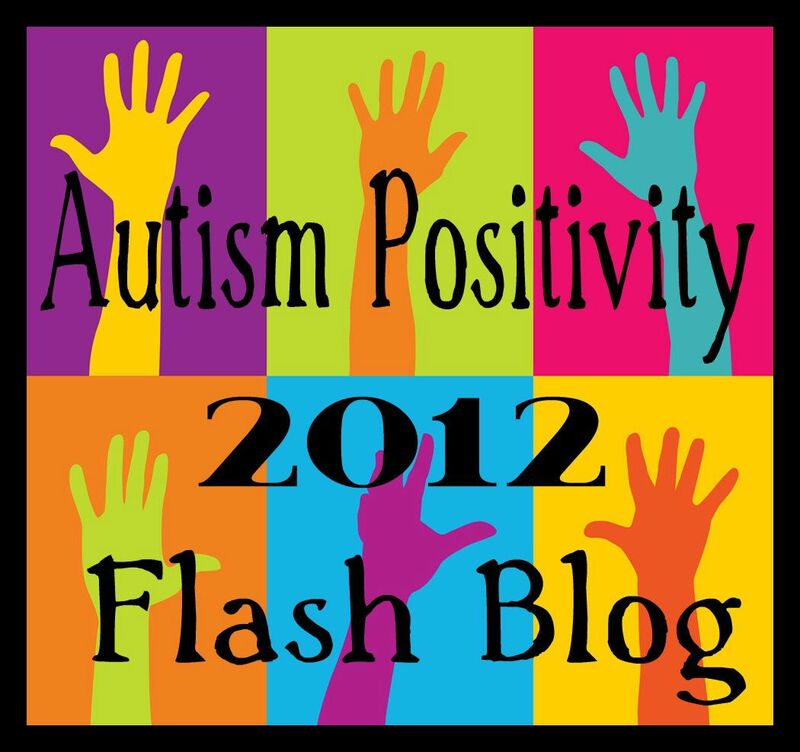 This entry was posted in Arizona, Arizona TASH, Autism, Communicate, inclusion, Laura Nagle, perspective of others, promote social understanding, Purchase Vectors of Autism: Laura Nagle, self-advocacy and tagged advocacy, Arizona TASH, AzWINS, Dear teacher: A letter from H, I am Norm, inclusion, Keynote Address, Perspectives, resiliency, self-advocacy, Special Education, Vectors of Autism. Bookmark the permalink. Woot-Woot! Go, H! this is a fantastic story. So much for everyone to take pride in! oh I am sharing and tweeting this out! Yay Leah! Yah H!! So happy to read this. This is really special. My son (13 years old) gave a prepared speech in his English class this morning and his topic was Great people with Aspergers and how he is going to make it. The whole class cheered him and his teacher promptly signed him up for the Public Speaking Group. Since lower grades he wanted to tell people about Aspergers and Autism.. Thanks for sharing this! What an incredible experience and response for your son. I love that the class cheered – a lovely show of support (from the teacher too). I’ll bet your boy was standing a little taller as well. Please tell him to keep up the awesome advocacy work! Thank you ever so much for sharing! Wonderful and inspirational story. That is an amazing young man you can be really proud of. Have to share it with my friends right away.